Time spent in the company of the personable Roddy Frame is always time well spent I feel. Although I do so hate the fact he appears to have gained not a single ounce to his frame (ha-ha), not a single line to his face and lost barely a single hair over the last quarter of a century or so. Life is just so unfair. Something else I soon discovered had not diminished with time, was Roddy’s razor sharp wit as one or two (light-hearted, admittedly) hecklers found to their cost. Although I think Roddy pretty much brought the stuff on himself by accusing us of being "the most polite audience he had ever played to”. 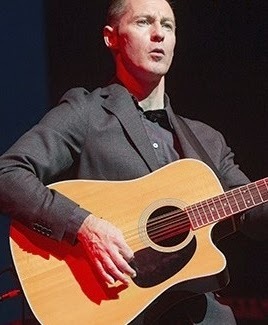 His previous visit to Glasgow (which I had not attended) had been a stop on his tour celebrating thirty years since the release of Aztec Camera’s debut album High Land, Hard Rain. A fair wodge of songs from this beguiling collection were aired this evening, but the set list drew much from all across his career, both AC and solo. Highlights were the Ivor Cutler inspired On The Avenue, We Could Send Letters (inevitably) and a rumbustious The Boy Wonders. The evening was not flawless though; Roddy’s technically breathtaking acoustic guitar blow-out at the end of Down The Dip perhaps just dipped into the realms of self-indulgence, and one of the new songs Postcard (nothing to do with Alan Horne) sounded like some clichéd Eagles/West Coast/AOR thing. It may have been a parody but I think Roddy, regretfully, was playing this one with a straight bat. But these were minor blips in an otherwise fun evening. And even the potentially cringe worthy introduction of Wild Mountain Thyme into Killermont Street (which briefly and slightly surreally turned proceedings into a Corries' gig) somehow worked. Yes - it can be a bit of a bugger when work impacts upon one's real life.